And here’s a beautiful deal – we have a very rare “Fall Leaves” special on our rental cabins right now with savings of up to 30% through October! Check the Cabin Rental Specials page for details. But do yourself a favor if you want to book a cabin and call us directly at (866) 347-6659. We can recommend cabins based on your dates and needs, and save you a lot of time. Many of the cabins are already booked through October – it’s a huge month for the area – but we can match you up with the right place for you. Fall in the Smoky Mountains is a lovely time to to be around the Gatlinburg / Pigeon Forge area. Take a look at these wonderful pictures of recent Fall colors in the Smokies at the website of the Great Smoky Mountains National Park, taken October 22, 2012. 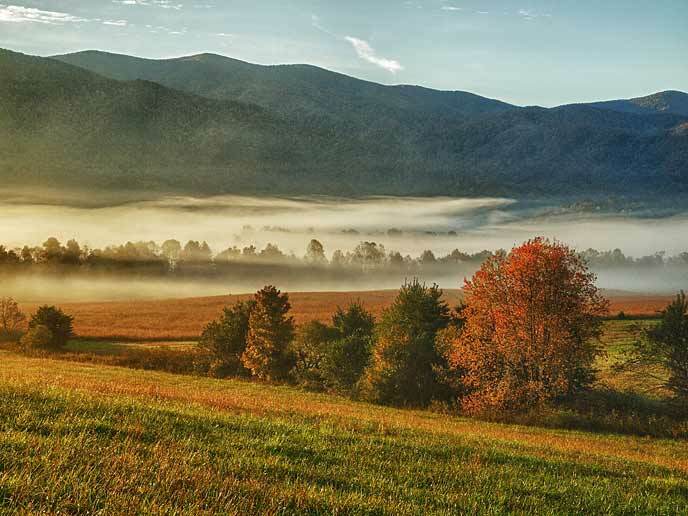 I especially love the inset image we’re featuring here, taken by retired Park Ranger Warren Bielenberg – utterly fantastic, and it so captures what we see all the time during Fall in the Smokies. So if you can take advantage of our Fall Leaves special, come and hang out with us while the season turns in its magical way. And if you can’t, don’t feel bad, every season is magnificent here, and this place stays amazing all year round. If you’re from out of town, what’s your best time you’ve ever stayed here? And if you’re local – what’s your favorite time to be here? Tell us your answer on Facebook or Twitter using the links below.